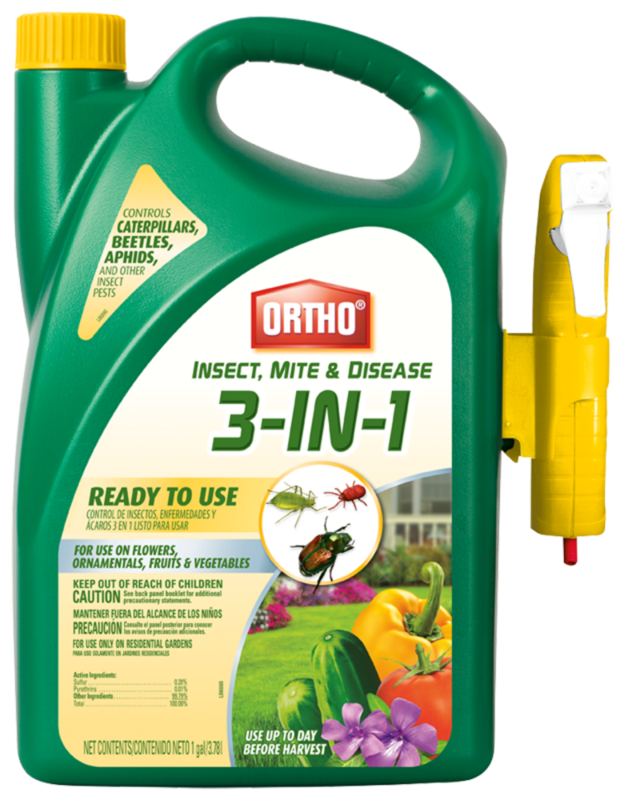 Ortho® Insect, Mite & Disease 3-in-1 controls a wide range of fungal diseases, as well as aphids, Japanese beetles, spider mites, whiteflies, caterpillars and other listed insects. Can be used up to day before harvest. Use on flowers, listed fruit and nut trees, ornamentals, vegetables and vine plants. Shake well before using. Do not dilute. Thoroughly spray all areas of the plant, especially new shoots and underside of leaves. Pests need to be contacted by the spray to be controlled. Shake well before using. Do not dilute. Thoroughly spray all areas of the plant, especially new shoots. For best control apply as a protective spray early in the season before the diseases are noticed. Re-spray every 7 to 10 days or after rain. May be used up to day before harvest. Apply at first sign of insects or insect damage. For best control apply as a protective spray early in the season before the diseases are noticed. Re-spray every 7 to 10 days or after rain. Re-spray every 7 to 10 days or after rain. Controls insects, fungal diseases and mites, including spider mites. Controls aphids, Japanese beetles, spider mites, whiteflies, caterpillars and other listed insects. Controls fungal diseases including blackspot, powdery mildew, rust, scab, blight, brown rot and leaf spot. Can be used up to day before harvest. Ants (excluding fire ants, harvester ants, Pharaoh's ants and carpenter ants), Aphids (including Green Peach Aphids), Armyworms, Bagworms, Beet Armyworm, Beetles (including Japanese Beetles), Blow Flies, Borers, Cabbage Lopper, Cabbageworms, Cankerworms, Caterpillars, Crane Flies, Crickets, Diamondback Moth Larvae, Earwigs, Fireworms, Fungus Gnats, Fruit Flies, Glassy Winged Sharpshooter, Grape Leaf Skeletonizer, Green Fruit Worm, Harlequin Bug, Hornworms including Tomato Hornworm, Katydids, Lace Bugs, Leafhoppers, Leafminers, Leaftiers, Loopers, Leafrollers, Lygus, Maggots, Mealy Bugs, Midges, Millipedes, Mites, Moths (Gypsy Moth (adults and larvae)), Mushroom Flies, Navel Orangeworm, Pear Psylla, Plant Bugs, Psyllids, Roseslugs, Scale, Silverfish, Skippers, Sowbugs, Spittlebugs, Squash Bugs, Stink Bugs, Tarnished Plant Bug, Thrips, Vinegar Flies, Webworms, Weevils, Whiteflies.